New on Fantastic Reviews is Aaron's review of Watermind by M. M. Buckner. This book was published in hardcover in late 2008, and is now available in paperback. "...Watermind is Buckner's fourth novel, the first to appear in hardcover, and there is no longer any need to discuss her potential. She has arrived, a talented author fully in command of her skills. 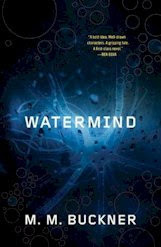 Watermind displays subtleties of characterization, description, and mood that are worlds beyond Buckner's first book." "Watermind begins in the present day, as a new form of life spontaneously emerges from the polluted waters of the Mississippi River. It consists of a neural net embodied in a colloid or chemical solution of networked microprocessors, nano-devices, and organic waste. Buckner is quite persuasive in making the spontaneous creation of this new type of life feel plausible. Really, where better is there on earth today to find a "primordial soup" to generate life than the waters of the Louisiana delta?" "Our heroine CJ Reilly ("CJ" for Carolyn Joan, but don't call her that to her face) first discovers this new life form in the aptly named Devil's Swamp near Baton Rouge, working on a cleanup crew at a toxic waste site owned by her high-tech employer Quimicron. CJ quickly butts heads with Quimicron CEO Roman Sacony, who wants to eliminate the colloid before he gets sued over it. Reilly wishes to preserve and study it, partly because she believes it may provide a means of cleaning polluted water--the colloid absorbs pollutants, leaving the water around it completely pure--but more because she feels a maternal bond with the strange entity, which she comes to believe is a self-aware "watermind...."
This week's featured book is Unclean Spirits by M.L.N. Hanover, book one of The Black Sun's Daughter series. The paperback's cover, showing a leather-clad woman with a tattoo on her back and a sharp weapon in her hand, proclaims that this is another urban fantasy. But what makes this book different, and what grabbed my attention (in addition to Denver being mentioned in the back cover blurb) is that Unclean Spirits was written by Daniel Abraham, author of the excellent fantasy The Long Price Quartet: A Shadow in Summer, A Betrayal in Winter, An Autumn War, and The Price of Spring. (You can see Aaron's positive review of A Shadow in Summer on Fantastic Reviews ). I bought Unclean Spirits a couple weeks ago at MileHiCon. Daniel Abraham was one of the authors attending the SF convention this year and I asked him to autograph the book. Apparently this copy of Unclean Spirits was already signed by "M.L.N. Hanover", but Daniel Abraham kindly added his signature below that of his pseudonym.